What do you want to see from BoA? Bank of the Atlantic is a multinational, international bank corporation. 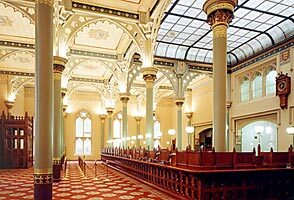 The bank has been in continuous operation since 1896 and is one of the most trusted, utilized, and reputable banks and has grown from running in train cars to running an interconnected, worldwide operation. The company is publicly traded on the Mariobo Stock Exchange, Florenza Stock Exchange, and the San Francisco Stock Exchange. The bank is the national banking provider for Kurone. The bank is a subsidiary of Atlantica Group. Bank of the Atlantic offers many services and is constantly working, expanding, adding services to stay as your trusted banking provider. If you would like to know more, please consult the listings below or call us for more information. Bank of the Atlantic provides loans to governments, companies, organizations, and individuals. From weddings to homes to cars, Bank of the Atlantic can personalize a loan package for you! We will fly your business into success by our investment services. If you are that new IT company that has a great philosophy but can't find the funds you'll need to start it, here at the Bank of the Atlantic, we'll work day and night to make sure your business has the day and light to succeed. Bank of the Atlantic is proud to offer interest (yearly) on all deposits within each account with us. We are also proud to offer low interest deals/plans on loans we give out. Bank of the Atlantic has large stores of currency, gold, and silver. Contact us to set up an exchange of currency to gold/silver or gold/silver to currency. Our rates are up-to-date (on the millisecond) and we promise you a great experience. Bank of the Atlantic provides banking services for many commercial and private airlines. With the BoA Let's Fly program, airlines can request financing to purchase new aircraft. Furthermore our partnerships with Aerobus Airspace, Republic-Aerobus, and Valkiir National Arms enable clients of Bank of the Atlantic to get a 5% to 25% discount on their orders. Just link a BoA account to the purchase to get the discount. Traveler cheques are as useful as cash and can be used in lieu of a credit/debit card. Bank of the Atlantic issues them in amounts of $10 SAD --> $1,000 SAD. Bank of the Atlantic has built high-security, nuclear-safe, underground vaults for the safety + security of the items with monetary value of our clients. We provide individual vaults for major governments and corporations as well as world organizations. Other clients can make use of shared BoA vaults. Bank of the Atlantic has an Extended Warranty Purchase Protection Program. The program covers all items worth less than $10,000 SAD and purchased with a Bank of the Atlantic card (not co-branded ones, only those issued directly) and extends the manufacturer's warranty to up to 24 months. A claim must be filed within that 24 month time period. All claims subject to review by the Warranty Department. 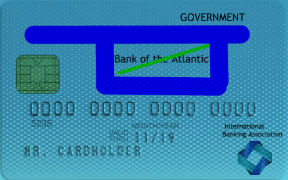 The Government Card from Bank of the Atlantic has over 60 security features and is interconnected with a central system and has constant, 24/7 monitoring to prevent fraud, misuse, and other factors that can be considered a security breach. Unlimited authorized users may be added and the card is also linked with the safety and security of the IBA. 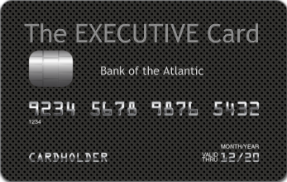 The Executive Card from Bank of the Atlantic has over 30 security features and is interconnected with 24/7 monitoring for anti-fraud, anti-misuse, and other factors that can be considered a security breach. 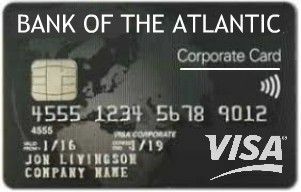 The Corporate Card from Bank of the Atlantic has over 40 security features and is interconnected with a central system and has 24/7 monitoring, anti-fraud measures, anti-misuse, and other factors that can be considered a security breach. A $100 bonus is available with each additional authorized user. Corporate branding is available free of charge with approval from the bank. 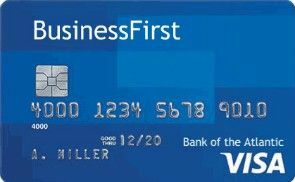 The Business First Card from Bank of the Atlantic is intended for use by startups and small businesses. With over 30 security features, the card directly links your bank account with your business. Each authorized user that is added, a $50 bonus is available. If the cardholder spends $3000 within the first 6 months of card opening, a $1000 bonus is available. The card also offers a 5% discount when shopping at Bank of the Atlantic partners. 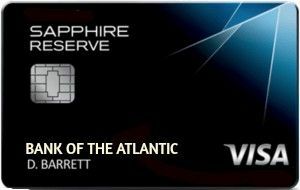 The Sapphire Card from Bank of the Atlantic is intended for use by frequent travelers and frequent-flyers. With over 20 security features, wherever you go, the card and your money will be safe and secure. The card is compatible with many airline frequent flyer systems and you can book directly with Bank of the Atlantic. There is an $800 bonus towards travel when the account holder spends $1600 on purchases within the first 3 months of opening. Cardholders are eligible for one free night at any PATA Hotel & Resorts per year with spending at least $3000 in purchases. The card offers 5% cashback on travel/dining and 2% on all other purchases. 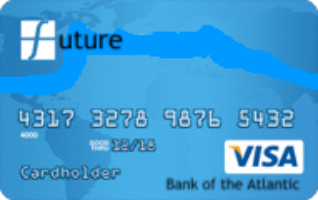 The Future Card from Bank of the Atlantic is the card offered to personal accounts. The card has over 18 security features and is chip-enabled as well as having a magnetic stripe, for ease of use and the peace of mind of security. This card offers an $800 opening bonus if the holder spends at least $1600 on purchases within the first 3 months of opening. There is 3% cash back on gasoline/groceries, 2% on travel, and 1% on all other purchases. Points are automatically added to your account as funds and can also be redeemable with an ATM card/debit card. 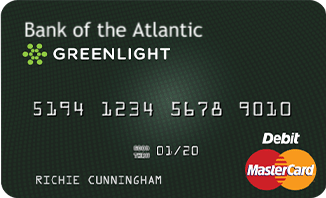 The Greenlight Card from Bank of the Atlantic is an spin-off version of the Future Card. and is intended for use by minors and students. The card has a monthly maximum which can be set by the parent or guardian of which the card is connected to (not over $1500 SAD). The parent or guardian of the account can also choose select companies/brand the credit card may be used with as well as other features ensuring privacy and security. The card is available to those under the age of 24. Upon reaching the age of 24, the card will be automatically upgraded to the Future Card. This is the code for me to approve your applications. On behalf of everyone here at the Bank of the Atlantic, I'd like to personally thank you for applying to our bank. It is also my pleasure to inform you that we have [color=#40BF40]APPROVED[/color] your request for (fill in). Thank you for doing business with us and we hope to serve you well. This is the code for my proposals. On behalf of everyone here at the Bank of the Atlantic, I'd like to personally pitch an offer to your respectable company of which should meet and exceed your expectations. We hope you accept this proposal. Last edited by Argentinstan on Tue May 01, 2018 7:44 am, edited 136 times in total. Bank of the Atlantic is a multinational, international corporation based in Mariobo, Argentinstan but also with several headquarters around the world including one in Florenza, Florenza Island. The company is led by the Chief Executive Officer, Olivia Benson, and the executive board of the company. The bank has been continually providing financial services since 1896. Bank of the Atlantic was founded in 1896 as Bank of the Argentine in Mariobo, Argentinstan. The bank was operated in train cars and provided banking/financial services to clients at every train stop. That way of banking proved popular and laid the foundation for the company's popularity today. In the mid-1900s, when air travel became the new trend, the rolling bank branches were mostly discontinued and replaced with permanent bank branches in cities, towns, villages, and other points of interest including train stations, airports. The efficiency of the bank made the model work and the funds of which customers deposited and withdrawn were kept safe through a complex network of security agents. The bank was renamed in 1960 from Bank of the Argentine to Bank of the Atlantic. The renaming was due to the expansion of its services internationally and therefore the bank adopted a more international name, rather than staying "Argentine" as what it was called due to its prominence only in Argentinstan during the period before the renaming. In 1969, when the first ATM (automated teller machine) was introduced, Bank of the Atlantic executives got the ball rolling for Bank of the Atlantic to have their own ATMs installed. The motto of which the initiative, Operation Automation, was "Get the machines in every city, town, train terminal, airport, and shopping centre." French translation: "Obtenez les machines dans chaque ville, gare, aéroport, et centre commercial." The company grew rapidly through until the 2000s when the technology boom hit. The bank scrambled to get new technology and create new tech systems to keep up with the growing trend. The banking sector was transformed. The bank entered its first crisis in late 2007 and continued until the start of 2009, of which is dubbed the 2008 financial crisis. The bank was still stable however but the stock markets crashed, leaving a negative effect. The bank's stock dropped 6 points on July 18, 2008, the largest drop on a single day in the bank's history. WIth the leadership of CEO Olivia Benson, the bank recovered within months and was back to stable operations. Olivia Benson is the Chief Executive Officer for the Bank of the Atlantic. She has been with the company for her entire career, starting after she graduated with honors with a degree in finance. Benson immediately joined the administrative arm of the company and mainly worked with important clients of the bank, sorting out financial issues, taxation, and security of their money. With her style of efficiency, speed, and accuracy, her superiors quickly noticed and she was received several promotions, of which she all declined, stating that "my commitment is to my job and my clients; not joining the pyramid of ordering people around." She continued at her position until 2006 when the post of Chief Executive Officer was empty, and once the board offered Benson the job, she took it up. Benson led the bank through the 2008 financial crisis, the bank majorly untouched. She piloted efforts to restructure the bank and provide more benefits to clients and opportunities for employees. Rick Murray is the Chairman of Bank of the Atlantic. He transferred recently from Atlantica Group to serve as Chairman for Bank of the Atlantic. Murray graduated from the University of Coronation @ San Francisco with a doctorate degree in business management. Nick Amaro is the Chief Operations Officer for the Bank of the Atlantic. Amaro has been with the bank for over 15 years, starting as a bank teller in the primarily French-speaking part of Argentinstan, central Coronation. He rose through the ranks, becoming next the manager of the bank branch he was working at. Then he transferred over to the administrative bureau in the Human Resources Department. He was offered a promotion to the executive board in 2012 and he accepted. He served on the board until 2014 when he was promoted to COO of the company. As Chief Operations Officer, Amaro worked on employee life and benefits. Bruce Wyane is the Chief Financial Officer for the Bank of the Atlantic. 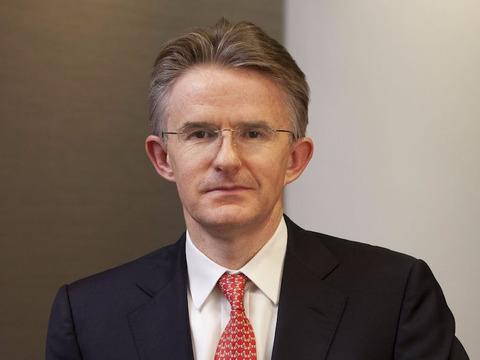 Wayne previously worked for several other financial companies such as the Kapum Group before joining the Bank of the Atlantic in 2015 to assume the post of CFO. As the CFO he has led for improvements in managing finances, innovative new rewards programs, and much more. Loren West is the Chief Administrative Officer for the Bank of the Atlantic. Loren West joined Bank of the Atlantic in 2011. Rachel Murray is the Chief Information Officer for the Bank of the Atlantic. Rachel Murray joined the company from CNN in 2005, starting in the technology department before being offered a promotion in 2008 to the Chief Information Officer. Michael Horn is the Chief Technology Officer for the Bank of the Atlantic. Horn graduated from the Coronation Institute of Technology (CIT) with a degree in computer science. Jay Stratford is the Chief Public Relations Officer for the Bank of the Atlantic. Stratford previously worked with the bank as the Chief Executive of BoA in Argentinstan before transferring to the worldwide bureau. Since then he has been leading campaigns to reduce the customer hold time on the phone to no wait time, hire more customer representatives, invest in newer offices/technology, as well as working on new ways to communicate -- email/chat. He also took over the company's marketing division, merging it into the public relations department. Marianne Lake is the Chief Human Resources Officer for the Bank of the Atlantic. Lake joined the company in March 2017. Sir Charles Arthur Hamilton, is the incumbent Chairman of The Hamilton Holdings Group, LLC., a multi-national holdings group based in Los Bouxiana, Dou Boux. An old stalwart in the oil business, he co-founded Hamilton Holdings in 2016 to act as a holdings group for the substantial assets of his family. He spearheaded Hamilton's investment in the Bank of the Atlantic (a bank that he holds tremendous faith in, and which he says in the bank he has the most faith in) and in November 2017, was invited to join the Executive Board of Directors. Jane Constance Hamilton Newcome, Dowager Baroness Newcome, Vice-Chairperson of The Hamilton Holdings Group, LLC, and sister of Sir Charles Arthur Hamilton, has been an entrepreneur and businesswoman for over thirty-five years. She was voted Dou Bouxian Businesswoman of The Year in both 1995 and 2007. She is the widow of Robert John Newcome, 18th Baron Newcome of Newcome (Chairman of Newcome-Reynolds), and currently hold a 55% stake of Newcome-Reynolds worth NS$25,5 billion. She is the current Chief Executive Officer and Managing Director of Hamilton Hotels & Guest Lodges, and has grown the company to a multi-national corporation with hotels and resorts all around the world. On the 11th of November, Lady Hamilton was invited by her brother's close friend, Olivia Benson, to become a member of the board of directors of The Bank of The Atlantic, an internationally acclaimed banking house based in Argentinstan. She accepted, and took part first board meeting a few days later. Lady Newcome is an incumbent member of the board of directors and holds a 20% stake in HHG (Class A stock) worth NS$244 billion, and has an overall net worth of NS$269.5 billion. Sir Charles Hamilton's wife of fifty-five years, and mother to Randolph, William and Lady Amberside; Lady Hamilton is the current matriarch of the Hamilton family. The then nineteen-year-old Lady Hamilton met and fell in love with the thirty-year-old Sir Charles in 1960, and they have been together ever since. Lady Hamilton married Sir Charles on the 2nd of May 1962, and their first child, Randolph, was born a year later, in June 1963. For the first twenty years of their marriage, Lady Hamilton was content with being the "Second Lady of Oil" (as she was dubbed by the media. Sir Charles's mother, the "First Lady", was still alive at the time) and house-wife. She gave birth to their second child, Elizabeth, in 1967, and their third, William, in 1970. In 1985, Lady Hamilton joined Hamilton Energies (then called Hamilton Oil) as an executive in the Sales & Marketing department. Through shear hard work and dedication, she rose to the position of Head of Sales & Marketing, a position that she still hold today. In December 1990, Sir Charles appointed his wife to the position of Vice-Chairperson of Hamilton Energies (then called Hamilton Oil), which she still holds to this day. In October 2017, Lady Hamilton was asked by her husband if she would join the Board of HHG as an Executive Director. She accepted, and on the twenty-fifth of October took part in her first board meeting as a member of the Board of Directors of HHG. On the 11th of November, Lady Hamilton was invited by her husband's close friend, Olivia Benson, to become a member of the board of directors of The Bank of The Atlantic, and internationally acclaimed banking house based in Argentinstan. She accepted, and took part first board meeting a few days later. Lady Hamilton (now dubbed the "First Lady of Oil") is a noted philanthropist, who, along with her sister-in-law, Lady Newcome, has donated millions to charity. At the age of 76, she has no intentions of retiring just yet. Lady Hamilton currently has an estimated net worth of just over NS55.5 billion. Bank of the Atlantic, for its entire existence, has been committed to giving back to the community of which it services, donating to educational and welfare programs, and supporting non-profit organizations. Recurring cooperation with organizations like the Uruguistan-based Greenco Group, the Red Cross of several nations, and other organizations, are the foundation of our business and ideology. 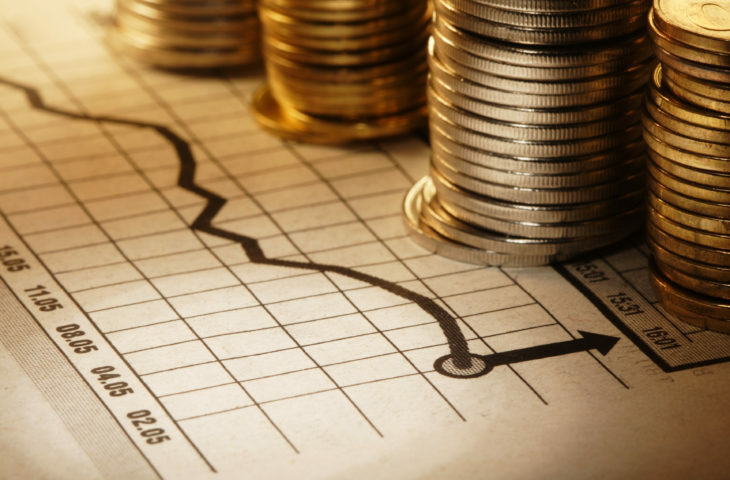 However security of our clients' fund and their trust are valuable to us as well. We pride ourselves on our constant monitoring of funds and financial standings of companies, governments, and entire nations worldwide. Most of these serves are complimentary and courtesy of the Bank. Last edited by Argentinstan on Tue Nov 14, 2017 11:02 pm, edited 20 times in total. At the Bank of the Atlantic, we have 5 different types of accounts and cards. They accustom to clients of different needs so please, accustom yourself to them before applying for a card. If you need help, our tellers and consultants at any bank location will be glad to be of service. An executive account is recommended for those with large sums of money and influential persons of companies/organizations/governments. A corporate account is recommended for large businesses/companies/corporations which can be the holding account for dozens of sub accounts for company executives, employees, contractors, etc. A Business First account is recommended for startups and small businesses. The Sapphire Atlantic account works best for the frequent flyer or the frequent traveler. This account offers many travel rewards, is integrated with mileage programs, lots of discounts and special offers, and an extended warranty program. The Freedom account is recommended for those who frequently shop and dine out and order online. The account offers 50% off discounts for some companies while also rewarding everyone with the peace of mind that if something goes wrong, BoA is here to help with extended warranty. Personal - Future Card accounts are directed towards the everyday use. They include cashback at the pump, dollars back from the checkout line, and credit back from travel. Personal - Greenlight accounts are directed towards minors. 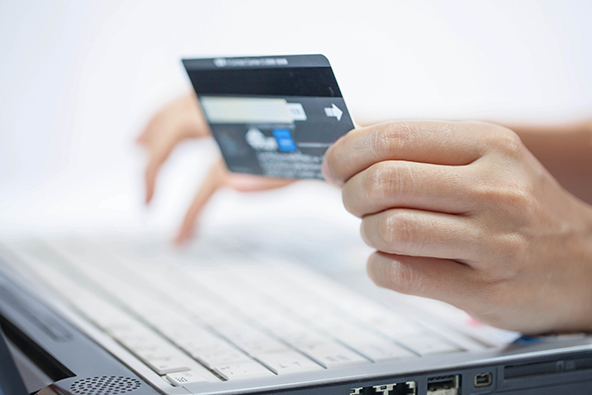 Such an account is the perfect way to introduce kids/teens to credit cards and credit ratings. Last edited by Argentinstan on Sun Feb 18, 2018 9:28 am, edited 40 times in total. Last edited by Argentinstan on Thu Jul 19, 2018 8:44 am, edited 206 times in total. Our banking institutions provide a safe, secure, and welcoming style of banking for you and anyone stepping foot into any of our locations. Each location is outfitted with tellers, consultants, ATMs, and refreshments. If there is anything you need, inform our bank tellers and they will try their best to enhance your visit. Locations also provide services to clients of other partner banks through the International Banking Association. 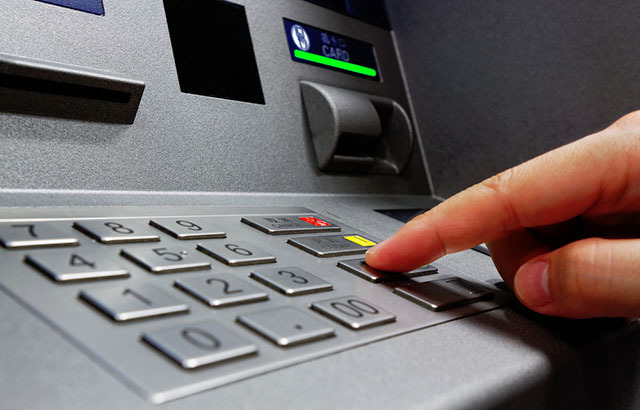 No ATM fees (withdrawal, deposit) will be charged nor will we treat IBA clients any differently from our own. Furthermore free, secure wifi is available to all, provided courtesy of Connectarg. Last edited by Argentinstan on Thu Jul 19, 2018 8:45 am, edited 72 times in total. We welcome everyone to open an account or have us build bank locations in their nations. Applications below. Apply for a bank location to be built! [spoiler=Terms and Conditions]Loans from Bank of the Atlantic are intended to be as a loan. The loan expected should not be more than a single nation's GDP or should they exceed the borrower's debt. The loan should be paid back to the bank in monthly or yearly (at the leisure of the borrower) installments, to be specified at the time of borrow. 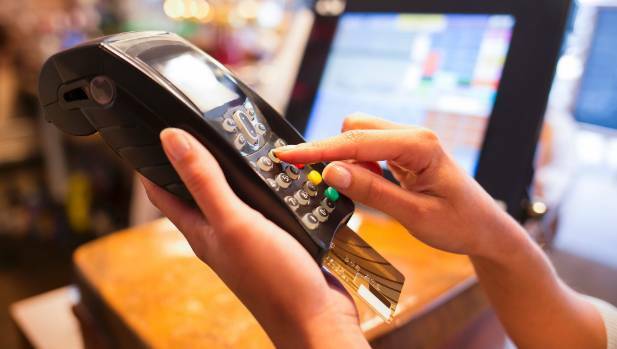 Apply for a commercial franchise credit card! All loans are provided by Kapum International Holdings Group. Last edited by Argentinstan on Sat Nov 04, 2017 3:53 pm, edited 12 times in total. OPEN FOR BUSINESS! APPLY NOW! On behalf of everyone here at the Bank of the Atlantic, I'd like to personally thank you for applying to our bank. It is also my pleasure to inform Reino do Brazil Consortium that their application for a "GOVERNMENT" account is APPROVED. "Partnering for Change, Engaging the World"
Economic laws: Laws are very relaxed, most power is from eco friendly or nuclear fusion power plants. Regulations remain low however quality, corruption, and safety regulations are also in place. On behalf of everyone here at the Bank of the Atlantic, I'd like to personally thank you for applying to our bank. It is also my pleasure to inform the Joaquin States Government that their application for a "GOVERNMENT" account is APPROVED. On behalf of everyone here at the Bank of the Atlantic, I'd like to personally thank you for applying to our bank. It is also my pleasure to inform Duestchstien that we have APPROVED their request for bank locations. Cities with locations: All state capitals plus when justifiable. On behalf of everyone here at the Bank of the Atlantic, I'd like to personally thank you for applying to our bank. It is also my pleasure to inform Felipe Furtado that we have APPROVED their request for an account. We furthermore also APPROVE new bank locations in the 2nd Brazillian Empire. Last edited by Argentinstan on Sat Apr 22, 2017 12:51 pm, edited 2 times in total. On behalf of everyone here at the Bank of the Atlantic, I'd like to personally thank you for applying to our bank. It is also my pleasure to inform you that we have APPROVED your request for an account and several sub-accounts. On behalf of everyone here at the Bank of the Atlantic, I'd like to personally thank you for applying to our bank. It is also my pleasure to inform you that we have APPROVED your request for an account. Entity: Japaneseland National Holdings Ltd.
Last edited by Argentinstan on Sun Apr 23, 2017 11:53 am, edited 1 time in total. I like TGs so send me one if you wish. On behalf of everyone here at the Bank of the Atlantic, I'd like to personally thank you for applying to our bank. It is also my pleasure to inform the National Council for Greenland's Restoration that we have APPROVED their request for an account. Economic laws: Law is the most lax in the region, with nearly no restrictions on businesses, with Retail, Gambling and Arm's Production the primary industries here in The Shekel. Cities with locations: Jew Central Station, Southern Port #1, Northern Manufacturing Province, The National Mall City, Residential Provinces 1 through 15. Any comments? The extensive location amount will be necessary due to the excessive amount of daily transactions performed by citizens.